Born Anna Maria Louise Italiano in The Bronx, New York on 17th September 1931, Anne Bancroft began her professional acting career at Fox Studios in the early 1950s but after a brief interlude being woefully underused at the fading studio she returned to New York to study acting further with Herbert Berghoff and Uta Hagen whilst still continuing to work on stage. By 1958 she was starring opposite Henry Fonda in Two for the Seesaw on Broadway and the following year won a Tony Award for for thrilling performance in The Miracle Worker. 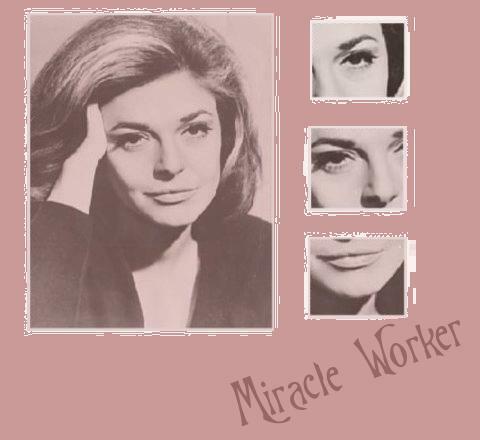 She returned to Hollywood at the request of Arthur Penn who insisted she recreate her Tony Award winning role of Annie Sullivan in film version of The Miracle Worker. His stead-fast belief in her proved justified and she duly won the Best Actress Academy Award for her performance. She followed up this success by travelling to London to film Harold Pinter's film The Pumpkin Eater the same year as her marriage to the actor/comedian/writer/director Mel Brooks. Ms. Bancrfot continued to make movies and it was in 1967 that she created the role which defined the rest of her career and with which she will be forever associated: Mrs. Robinson in Mike Nichols iconic coming of age movie The Graduate. After giving birth to their only son Max Brooks in 1972 she continued working in Hollywood on various movies, including the beautifully touching The Turning Point, throughout the 70s. She took a small break from the screen in 1977 to star on Broadway in the stage play Golda. In 1980 Ms. Bancroft branched out to write and direct her first (and sadly only) movie Fatso, starring alongside Dom DeLuise. However, for various reasons, she returned to concentrating on acting and during the 80s created many memorable and powerfully realised characters: Estelle Rolfe, Mother Miriam Ruth and Helen Hanff are just three that stand out. The 1990s saw Ms. Bancroft return to television in the sitcom Freddie and Max and persue smaller cameo roles. The most notable exception being Glady Joe Cleary in How to Make an American Quilt. She voiced her first animation in the shape of Antz. Ms. Bancroft continued to appear in the movies during the first few years of 2000 and in 2002 she starred in The Occupant on Broadway. She died on 6th June, 2005. For a more general information go to Anne Bancroft's IMDB profile or why not take a peek at our own selected filmography.